5:50–Nasty winter weather and disruptions to federal programs like SNAP have made this a hectic season at the Northeast Iowa Food Bank. Tim Harwood talks about the challenges with Food Bank Executive Director Barb Prather. 6:35–A federal court has stopped San Francisco from putting warning labels on sugary beverages. 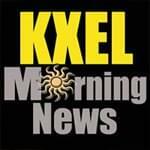 Fox News Radio Legal Analyst Loretta Powers talks about the sour news for the plan’s proponents with KXEL’s Jeff Stein. 6:50–If you were an adult who couldn’t read, you would find a variety of organizations offering programs to help you learn. Resources for the financially illiterate aren’t always as easy to find. Tim Harwood talks with author and financial speaker Michael Finley about how anyone and everyone can become more money savvy. 7:35–TV9 Meteorologist Kaj O’Mara says the new week could see temperatures challenge the freezing mark, but also will likely bring more snow to eastern Iowa. 7:50–Author and financially literacy advocate Michel Finley returns to talk about tax season, and a step he would like to see in order for Americans to become more conscious about handling their money from an early age.